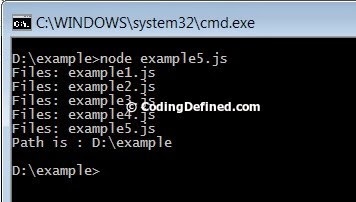 In this post we will show you how to get list of files in a directory in Nodejs. Before going into the code we will take you through some of the methods which we are using in this code. 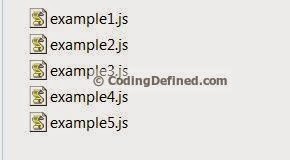 We will be using __dirname variable, which is a global variable in Nodejs and it represents the path to the Node.js script that is currently executing. If instead of return files; I type console.log (files); it works perfectly. But I want a return. Because fs.readdir() is an async call, so the variables that are set in the callback are not available directly after the call, that's why when you are trying to get the files outside the function it is giving undefined. Try doing like this but just keep in mind that './client' specified in fs.readdir('./client', function (err, files)) is a directory not file. OK, but there is no way to retrieve the value to use it in a structure next? while for example? Yes as far as I know there is a way to retrieve the value to use like the way I have shown in the above example just that you need to handle the asyn call. If you want recursive lists of files, and/or directories, and/or are interested in the file contents, check out node-dir https://github.com/fshost it makes dealing with these types of issues easy and has millions of users. I am new to programming. When I executed the code from the original poster, the names of all the files and subfolders got printout on screen. Then the path directory where this js code is located got display. Can someone explain to me why the fs.readdir() code segment got executed first and then followed by the code segment in fs.realpath()? I thought it should be the other way around as thefs.realpath() is listed first in the above code segment. their contract at you which has a fee yyou have tto pay.